1:1 Replacement for 30W G4 halogen light. The warm light color (2500-2800K) and color rendering (CRI:75) easily match those of regular halogen lamps. The energy-saving properties of this LED lamp and the long lifespan make this the perfect replacement for halogen spots. Please look below for a simple savings calculation. This calculation assumes that the lamp is lit for 6 hours every day. 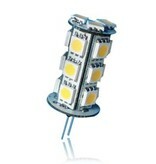 The average lifespan of this LED lamp is 30.000 hours, compared to 1.000 hours for a halogen lamp. Changing your lamps regularly is therefore a thing of the past! This especially comes in handy when lamps are in hard-to-reach places. The example above assumed the lamps were lit 6 hours per day, or 2190 hours per year. This means that in the above situation this lamp would have a lifetime of 13 years, saving €165 in electricity alone!